human bomb who exploded inside the Sbarro pizzeria. The backstory is here. Even dead bodies play a role in the Arab -v- Israel saga. In a sadly familiar instance of Palestinian Arab agitprop, the Ma'an News Agency, funded by European foreign aid and based in Bethlehem, recently ran a story entitled "Israel’s decades-long policy of holding Palestinian bodies" over the by-line of Emily Mulder. "the actual involvement of others in attacks at the time of their death has been disputed by the United Nations and Amnesty International." They presumably understand what they mean. To us, it sounds like more of what Ma'an is good at: liberal use of "alleged" when terrorism is being done to Israelis; the systematic casting of doubt on whether the attacks even happened, whether they were terrorism or "resistance", even whether the assailants had knives or whether the Israelis planted them next to the attackers' bodies. Not exactly a sophisticated approach. More a matter of heavy-handed agenda-based reporting. On Twitter, we are now (today - but on reflection why publicize the links?) seeing conspiracy claims that hitch a ride on "news" reports like that from Ma'an. Why are the bodies not being handed over? The answer for the stupefyingly credulous: it's simple - because the Israelis are harvesting Arab organs. This approach works well in societies where the leadership has to maintain a constant state of belligerence and demonization of the enemy i.e. today's Palestinian Authority. Not much doubt who the victims are, even though the piece is dealing with murderers and the families they leave behind. Ma'an's approach works far better for them than actually facing up to the realities of what the Palestinian Arab regime under Mahmoud Abbas does when bodies of dead jihadists are handed back to them. 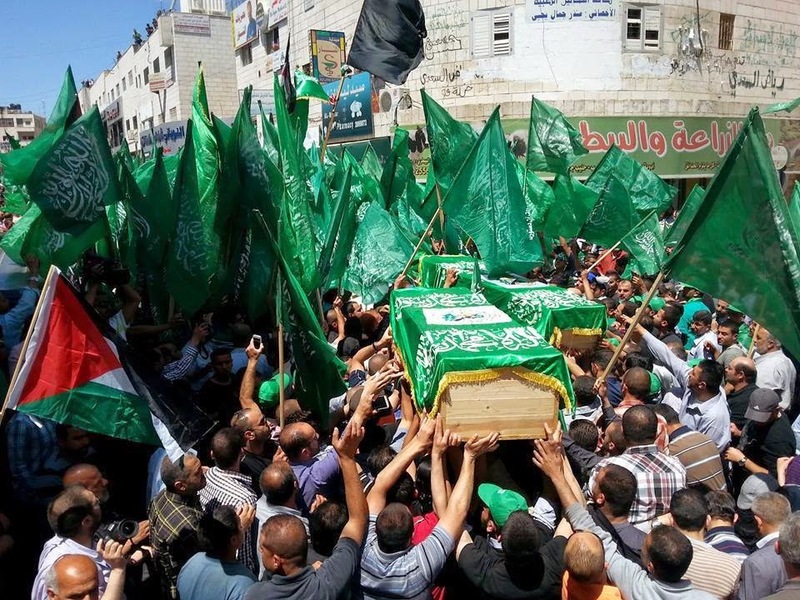 We described last year a festive commemoration that took place when the decomposed body of the human bomb who exploded inside the Sbarro pizzeria in Jerusalem was given to the PA: see "5-May-14: The making of a martyr: it takes more than a village". It's what death cults do. And no, it's not at all surprising that despite the very visible presence of Hamas flags and supporters, there's the high-profile involvement of senior PA figures. Arch-rivals they may be, but in their world everyone wants and expects to get a piece of the adulation of a certified martyr. At Ma'an, in the course of an article of more than 1,500 words, there's not a single mention of any aspect of this or of the fact that the remains were handed to the PA by the Israelis. Evidently that would spoil their narrative, their war campaign and their (excuse the deep cynicism) resistance.